In the 9/11 Truth Movement most "Truthers" are in general agreement regarding the events at the World Trade Centers in New York. Building 7 is the focus, as that is the collapse that is most evidently a controlled demolition with Pre Planted Explosives. Many Truthers, who are opposed to the Official Report, have agreed that it is correct regarding the Pentagon. This has given rise to a needless division in the Truth Movement. We see advocates of one or the other view, debating with ad hominem arguments back and forth. One will block the other from their on line forums. Someone from each side as called the other side "disinformation agents" and other such accusations. By siding with an incomplete theory, each side is forced in to a position of discounting and criticizing credible witnesses on the other side, as well - even those who were near the Pentagon explosion point on 9/11. Craig is forced to discount Fire Fighter Allan Wallace. Jeff is forced to discount April Gallop. This is totally unnecessary. This Explosives Filled Plane & Pentagon Theory (EFP&PT) is progress towards a Unified Pentagon Explosion Theory (UPET) showing that most aspects of both major theories are correct, and can co-exist in complete harmony in a pursuit of Truth..
We call the UPET it "Unified" because it unifies theories that were previously seen as opposite. We use the word "Pentagon" because it is mutually agreed that is where it occurred. All camps agree that an "Explosion" occurred, whether it was caused by bombs, an impacting jet, or both. It is a "Theory" until a New Investigation with subpoena power over the Pentagon can be obtained, evidence is presented, and prosecutions are made in a Court of Law. The conflict in the Truth Movement occurs when it is assumed that these are mutually exclusive theories. We shall consider the 9/11 Investigators who have taken the most time and trouble to call upon and interview actual Pentagon witnesses, the best evidence available to us, when so much information has been classified. These intrepid investigators, although amateur, have done what no one has done, and deserve high commendation for taking action, while the witnesses are still around, and evidence is still available. Instead of just sitting back and theorizing, they get on the phone and call witnesses directly. Craig has even traveled across country, and stayed at hotels near the Pentagon, at his own expense, to find and interview witnesses on video for everyone to review. Jeff and Craig have spent countless hours, posting their results on the web, setting up blog forums, sending out CDs, and doing online radio show interviews. However these two researchers have reached seemingly different conclusions from the witnesses they interviewed. This EFP&P Theory takes the best elements from each of the above three theories and combines them in to a new theory. CIT and PIO have both contributed greatly and tirelessly to the cause of 9/11 Truth. * Establishing that a NOC approach could not cause all of the physical damage to the lights and Pentagon. * Proposing that Pre Planted Explosives caused the majority of the Pentagon damage. We will see below how the EFP&P Theory acknowledges a NOC approach, but differs on the Pentagon damage. CIT and many in PFT assume that the plane must have flown over. But this is not necessarily so. OCT assumes that a plane caused 100% of the internal damage to the Pentagon. Not necessarily so. BrokenStyx also assumes that the plane must have been what caused 100% of the internal damage. The theories seem mutually exclusive. It is quite a quandary. Each of these witnesses sound so credible. In order to reach a compromise, Craig would have to give up the Fly Over Theory. Jeff would have to acknowledge the North Of Citgo and Pre Planted Explosives. 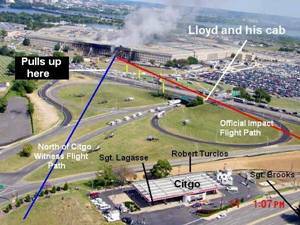 Craig would have no argument against witnesses of a plane hitting the Pentagon. Jeff would have no argument against Sgt. Lagasse and Spc. April Gallop. Both Craig and Jeff would be right.